Destin Dreaming -- 4Br/5Ba Destin FL Vacation of Your Dreams - Apt. Avail. Last Minute Availability in April - Discounted to $300/night, 3 night minimum!! Booking up Fast!! Click on the photos to scroll to the walk through video. Come enjoy Destin FL at this beautifully decorated 4 Bedroom 5 Bath 3-story cottage with cabana room and extra bath in quaint Crystal Beach. Mother in Law apartment with bedroom, bathroom and full kitchen can be added for an additional charge for parties up to 14 guests; required for parties of 13 or more. Just a short 2 block walk to the beach and just 3 blocks from Destin's premier shopping, the Destin Commons as well as many great restaurants. The expansive wraparound porches equipped with rockers are perfect to relax and unwind in the evening or sip your morning coffee and enjoy the breeze. 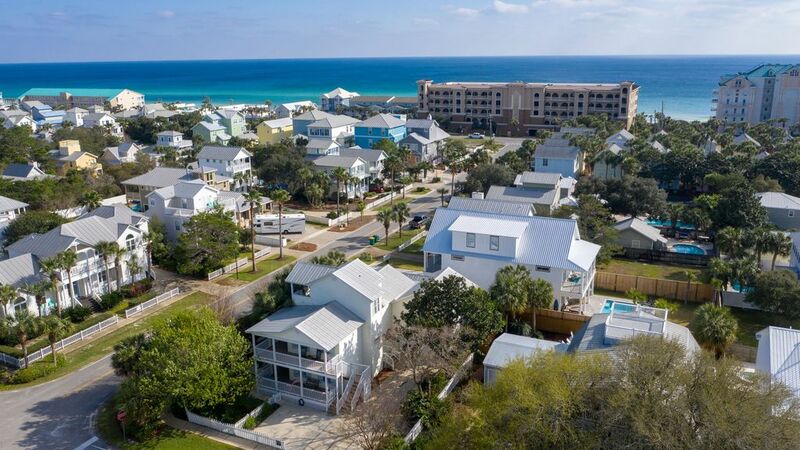 After a day at the beach, come home and take a dip in the private splash pool to cool off or take an evening stroll through this adorable community to catch Destin's breathtaking sunsets. Perfect for several couples or families to share, Destin Dreaming has 3 king size beds and a bunk room that is furnished with two sets of bunk beds (4 beds) and a PlayStation 2®. Destin Dreaming also has a cabana room with bathroom right off the pool equipped with a sleeper sofa & TV; could be a separate sitting area for your teen guests. The newly renovated mother in law apartment can be added to the rental for larger parties. The apartment has a bedroom with a king size bed, sleeper sofa in the living room, bathroom and a full kitchen. Looking for a little relaxation in the evening, enjoy the 50' Flat Screen HDTV located in the living room with digital cable, HBO and a DVD player. Destin Dreaming is the perfect accommodation for that dream beach vacation with family. We know you will love our fully equipped home away from home for all it has to offer; convenient location, luxury accommodations, beautiful beaches, great shopping, great restaurants, and a small town neighborhood feel. My parents own this wonderful beach home and my husband and I oversee it for them. I am a local Real Estate Agent and native of Destin. I take pride in offering a high level of customer service. If you have an issue during your stay, you can rest assured that I will be there promptly to take care of it! I look forward to meeting you! Location, Location, Location! My family purchased this home because they love the quaint neighborhood feel of Crystal Beach in Destin FL. The location is perfect as you are just a short 5 minute walk to the beach, there are plenty of restaurants, & shopping close by and you can get to Publix (and Starbucks!) without getting on Highway 98. This house has tons of balcony and covered porch space. One of my favorite things to do is sit on the porch swing and just enjoy the lush landscaping, birds, sea breezes and blue skies! Another bonus for families sharing the house,is that we have 3 king beds in the house as well as another King in the mother in law apartment. Destin FL has the most beautiful white sandy beaches and emerald green water - which is why we are called "The Emerald Coast"
The driveway can accommodate three cars back to back - there is also a small area to the left of the driveway that will allow for one more car. The city does enforce "no parking" on the grass. We provide bath and kitchen towels. Please bring beach towels. We have a large coffee pot & Keurig in the kitchen, a small pot in one of the 2nd floor bedrooms, one in the cabana room and one in the mother in law apartment. Excellent space for entertaining. Patio table with umbrella - sets 6. Plenty of loungers for sunbathing. This house was very last minute, we were literally already on the drive to Florida, when our vacation plans fell through. The owners made sure it was cleaned just as early possible and we were very grateful! It has a beautiful yard for the pets and kids. I never once had to worry about them. The inside is well appointed and has everything you need and was very clean even though we rushed them on the cleaning. It really couldn't have been a more perfect place for our vacation and we really hope we will be able to come back. The house and furnishings were very beautiful, yet comfortable and homey. Plenty of room for our large family and spacious outdoor areas. Excellent customer service when we called, took care of things right away. Very short distance to the beach. Beautiful neighborhood. The house had everything we needed and more. I would highly recommend this property to a friend! It had plenty of room, very comfortable, cabana room worked perfect for us. Pool was small but was awesome to get in and relax in the heat of the day or night. Beds were very nice and comfortable. The fenced in yard was great for our dogs. Would recommend to all family and friends and would stay here again. Beautiful Property! Best in the area! This was our second stay at Destin Dreaming with a 5 year gap in between and the property is just amazing! The house is beautifully maintained with every convenience from home you could want. The wrap around porches and gorgeous landscaping provide a very relaxing setting in the mornings and evenings. We really enjoyed the lounge area on the 2nd floor balcony in the evenings. The beach is less than a block away and the house is stocked with a beach wagon and plenty of floats plus a nice pool to enjoy if you want some privacy. We've stayed at several other houses in the area because we didn't plan far enough ahead to get Destin Dreaming and none of them compare to this amazing home! The house was perfect for my family and small dog. The house was beautiful and very pet friendly! The beach was only a short walk away. Close to all the best places to eat and shopping. We would definitely stay again! The homeowners were super helpful. THANK YOU From the D9 Girls! Destin Dog park is located on Commons Drive about 2 miles from the house.